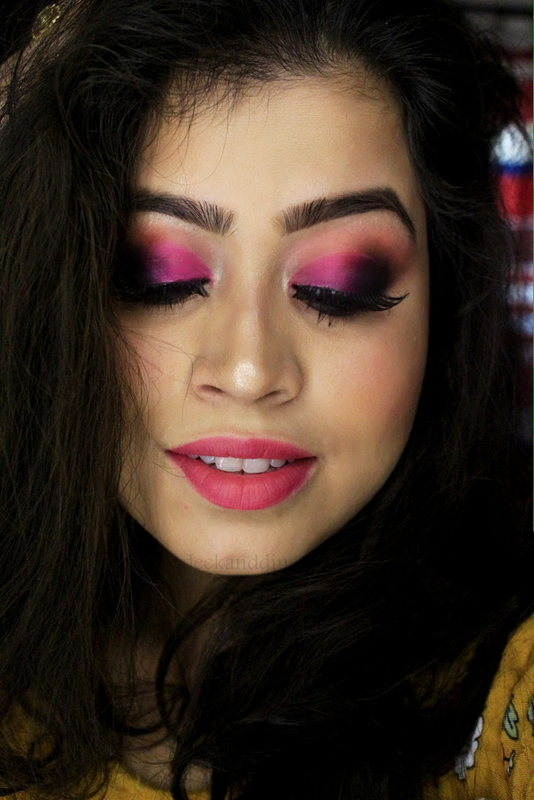 As promised I am back with another Valentine’s Day special look. 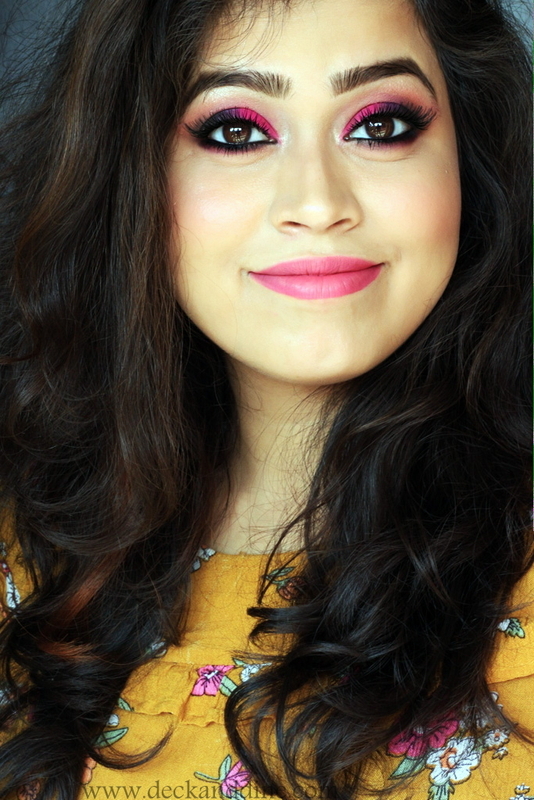 Yesterday’s looks were a couple of quick office/college to date night look transformations (you can check the post HERE) and today’s post is all about a full glam poppy pink smokey eye look. I feel smoky eye-makeup is very versatile and can be sported anytime of the day depending on the intensity. 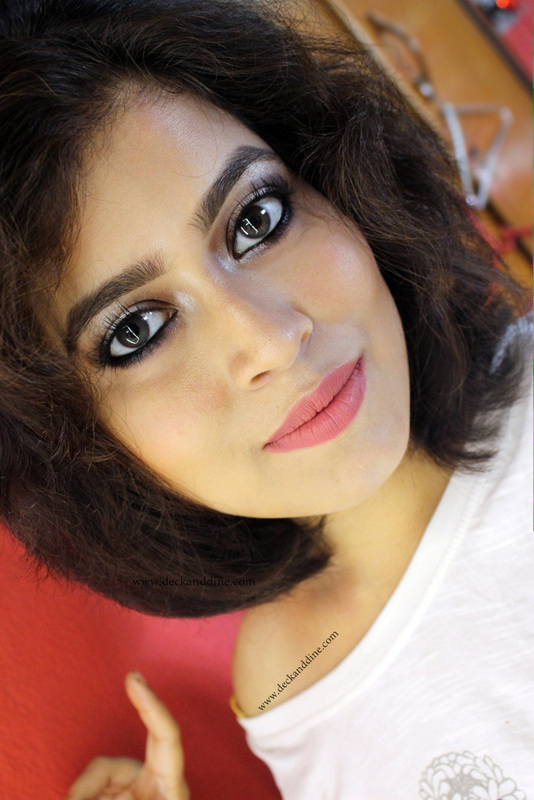 I am a smokey eye lover and most of the time when my fingers reach eye shadow palettes and brushes, I end up doing smokey eyes. Even today, I had something else in my mind but ended up doing smoky eyes. 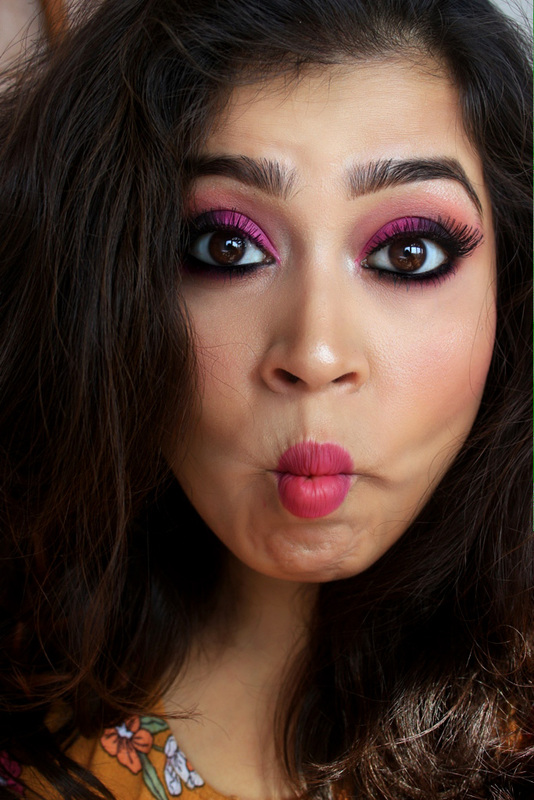 Keeping that ‘something else’ for someday else, lets get into today’s “Peppy Pink Smokey Eyes” look breakdown. This is again a simple look and you can easily sport it for tomorrow’s date night. Stick to this or play around with the intensity or even color if you want to; I am sure you are going to make heads turn with the look. Like always I am doing my eyes first, so that I can easily clean off the fallout. I started by grooming my eyebrows and prepping my eyelids. I applied a wash of skin colored eye shadow to get rid of any oily residue. 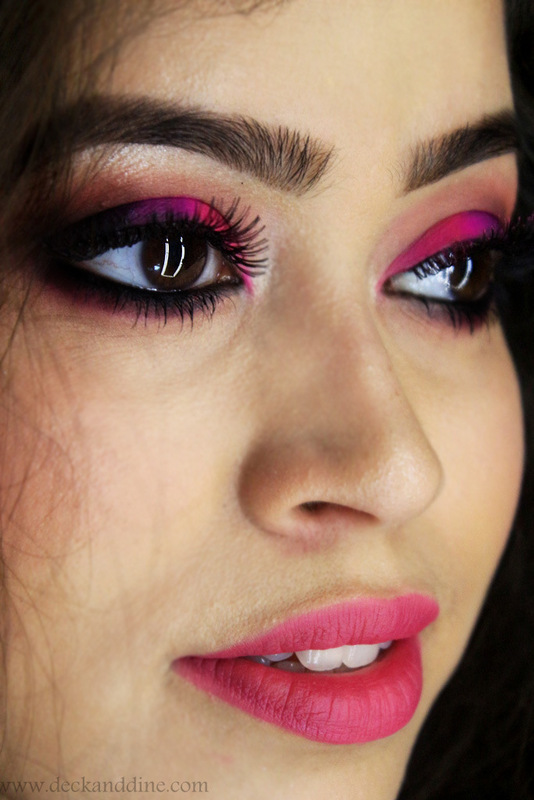 With a light pink eye shadow on a fluffy brush, I started going to and fro on the crease area. Then with an orange eye shadow I tried adding a gradient effect on my crease. 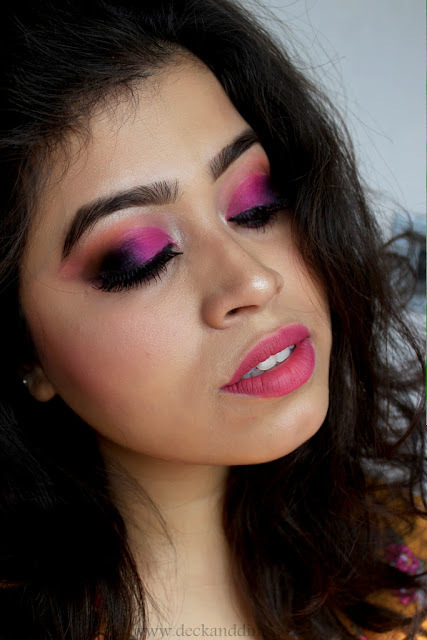 You can skip the orange and just add shades of pink for the gradient. Now I patted some matte black eye shadow on the outer corners. Blend well so that there are no harsh lines in between the colors or at the edges and everything is softly blended. Time to cut the crease. Take a flat brush and dip it in concealer. Now start applying it on the inner half of your eye. Follow your socket line for the clean crisp arc. Keep your eyes half closed so that you don’t ruin the arc before even moving to the next step. 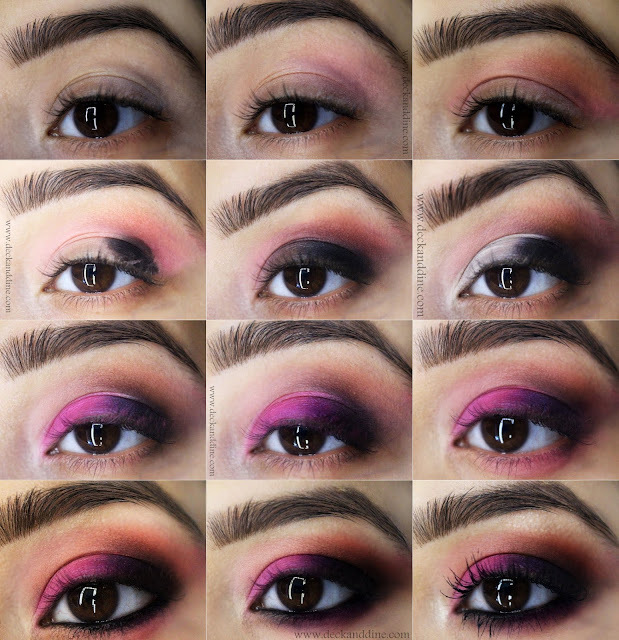 You can completely skip the concealer part if you don't want a cut-crease look. But concealers other than making cut-crease eye makeup easy to do, also helps in popping up colors. Now take a poppy pink eye shadow on your brush and apply it all over the concealer. 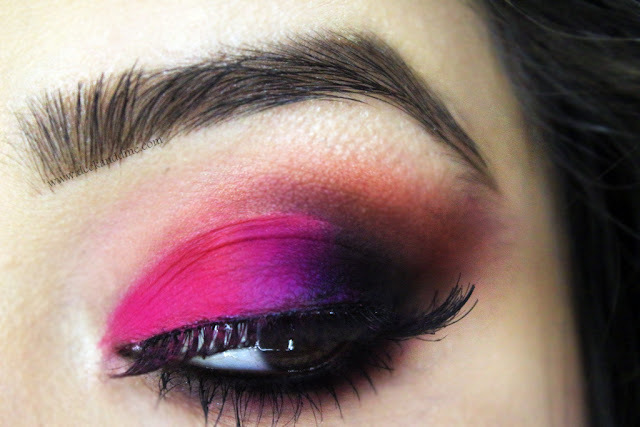 Dip a small fluffy brush in a purple and just blend on the portion where the black meets the pink eye shadow. You can again skip the purple and just blend the harsh lines in between black and pink with a clean brush, but using purple gives a nice gradient effect again. Now using the same fluffy brush, just lightly swirl over the pink eye shadow and go to and fro on your lower lash line. Take a smudge brush and smudge in the kohl with the pink on your lower lash line. Apply tons of mascara to round off the look. You can apply falsies as well. My eye shadows are from BH Cosmetics Take me Back to Brazil Palette. Kohl is Colorbar Just Smokey and Mascara is L'Oreal Paris Voluminous Manga Mascara. Wipe your face with a wet tissue. This will help you get rid of the fallouts and any dirt or oil. Now apply moisturizer and massage till it gets soaked in. I always advise to wait for 3-4 minutes after applying moisturizer and before moving on to foundation. Now apply your favorite foundation on your face and neck and blend everything well. Moving to the next step, conceal your under eye area and any other pigmentation on your face with concealer. I have dark circles and that is why I had to use a corrector before concealing. Set everything with setting powder of your choice. My corrector, concealer and foundation is from Kryolan Derma Palette. I have used Ben Nye luxury translucent Powder in Fair to set makeup. Swirls of a pinky blush on each cheek and apply highlighter on the high points of your face. You can contour if you want to but I skip contours generally. My blush is from Ben Nye Blush Palette and highlighter is Colourpop Flexitarian. I went for a pink lip cream to round off my look. 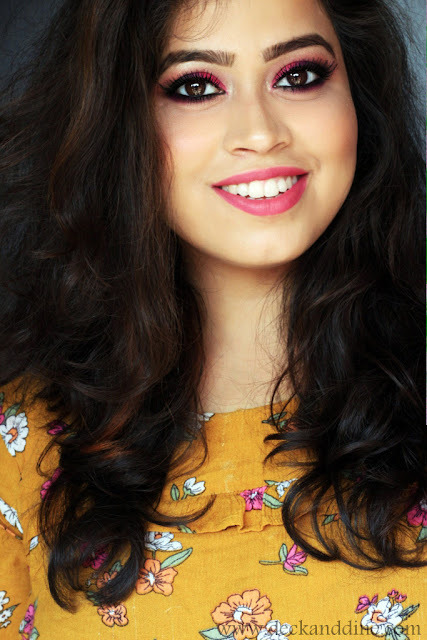 You can go for lighter tones as well.I have used Miss Claire Lip Cream No 08 here. That finishes the look. As the eye makeup is bold, make sure you keep the rest of the makeup subtle. Don’t go for blinding highlighters or extra bold lip colors. Let your eyes talk. Obviously you can play with the intensity of the eye makeup as well and can also replace the pink with other color of your choice. You can go from as dramatic to as subtle you want. 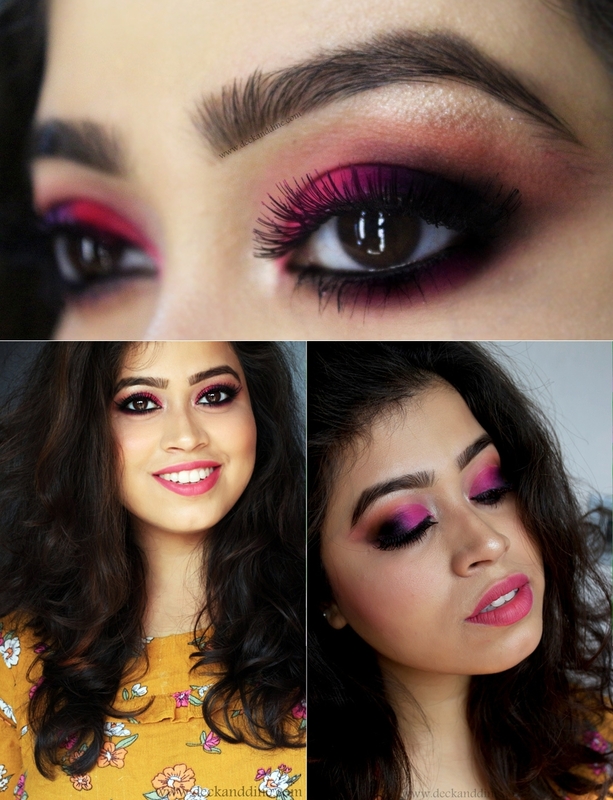 The step by step is so helpful and the overall pink look is stunning. Wish I could pull it off! LOVE the fish lips photo! So cute! 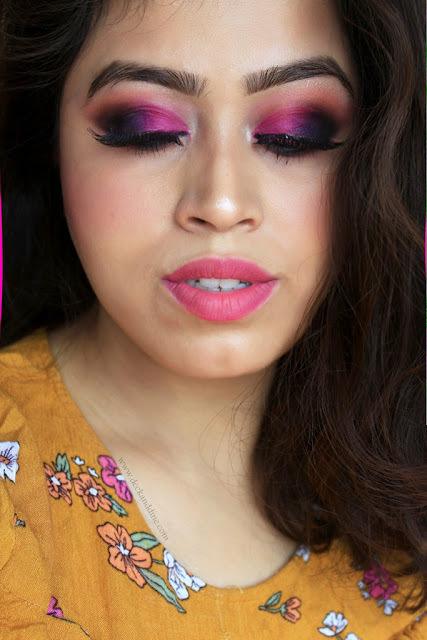 I am digging the vibrant pink/purple eye look! So pretty! A striking look. I am envious of your perfect brows. These colors are so pretty on you. Gosh that pink is stunning! You look amazing! 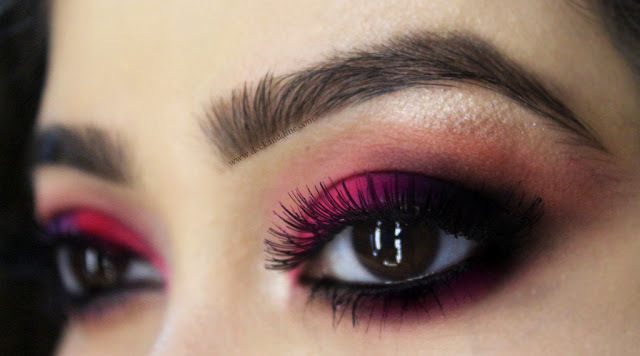 I absolutely love pink smokey eyes! I actually used to do something similar when I worked in an office, haha! I'm not sure how I got away with it, but I guess if its looks nice and not over the top it was okay. This is beautiful! This is beautiful! I love the lip color with them too. The pink looks so gorgeous on you! Love! I always think "how do you do a pink eye, and not look like you've been crying" and well THIS is how!